Weight loss in natural way is the best way to do. Here, we are explaining about a weight loss juice that can be made easily and that helps in lose weight fast. This weight loss juice is tummy reducer too. It is a chant for flat tummy. This juice is mainly made with Moringa Oleifera, which is called drum stick leaves. Majority of us knows that it is miracle product from the nature. When combined with lemon and honey, it multiplies its effect. We shall drive into how the use is made along with the complete details of Moringa Oleifera, such as its benefits, and also side effects, if any. Blend the first and second ingredients together in a mixer, until the leaves are grinded very well. Drain it in to a glass and add the lemon juice and honey. Consume it on empty stomach. Moringa Oleifera leaves is a factory of vitamins and minerals. The health benefits are not just bind on the weight loss. This helps in eradicating all belly fat, giving you a flat belly. The benefits of consuming moringa oleifera leaves are enormous. This drumstick tree is being produced I n India, the most. This tree loves to grow in hot and humid places where it will get sunlight in abundance and thus do not love to be at cold or freezing places. This Moringa Oleifera is seen in lavishness in the Central and North America. Due to its high nutritious and medicinal value the United States has started off with its cultivation in the Hawaii. How Moringa helps in weight loss? Like moringa oleifera loves hot places, the main property of its leaves is warmth. The above said juice when consumed in empty stomach, it helps in melting away the fat accumulated in the stomach easily and helps in flushing out all toxins in the body. As it also has the property of exterminating constipation, it will expel all the fat and toxins from the body easily. Besides, it also helps in increasing the metabolic activity of the body which aids in the weight loss very easily. It helps in increasing the haemoglobin of the blood. It has twice iron content than that of spinach and being falling under green leafy vegetables; it is the best medicine of anaemic persons. It helps in boosting the metabolism of the body. As we know, the higher the metabolic rate, the higher the chances of fat burning. Thus, as it ensures the increased metabolic rate, it can help in fast fat burning. These leaves helps in building the immunity power of us as it contains seven times more vitamin C than in oranges. These magic leaves help in eradicates constipation as it has high fibre content in it. Constipation is one of the main reasons of weight gain. It can be eliminated by fibre rich foods. Moringa Oleifera is a rich resource of fibre content and thus an ultimate solution for constipation. As it is rich in anti-inflammatory properties, it helps in dissolving the inflammation of the body and thus a good medicine for arthritis and osteoporosis. It also has the property of reduces high sugar level in blood. There are many studies that proved that it is the best medicine in treating type II diabetics. Moringa helps in reducing bad cholesterol in blood as it has the property of burning fat in the body. While help in reducing LDL, the bad cholesterol, it also helped in bring up the HDL, the good cholesterol in the blood. There by maintain the HDL, LDL ratio. 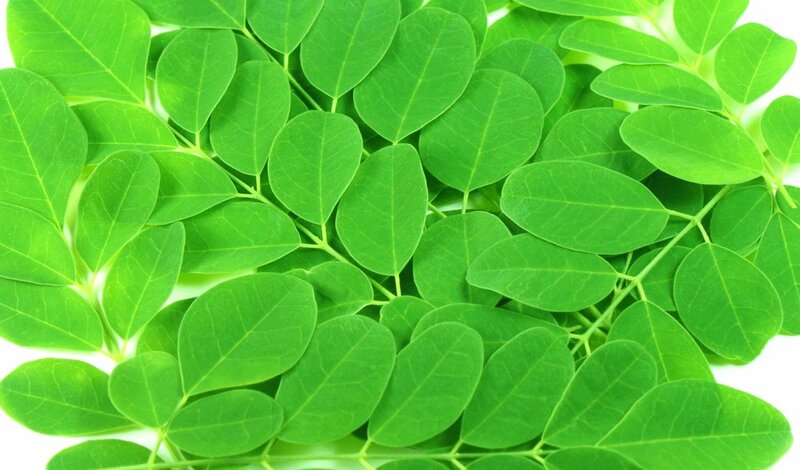 Moringa leaves are one of the best Ayurveda medicines in lowering high blood pressure due to the natural presence of Niazin and Thiocarbamates. Many studies have proved that it is very effective in treating hyper tension. As the drumstick leaves help in flushing out all toxins, it helps you to have a beautiful skin. It brings in transparency to the skin making it clear and soothing. All scars and marks can be erased with the help of this juice. It also has the anti- aging properties and thus a beauty agent too. It fights the aging property. While it is being used for weight loss, it can also be used for weight gain in kids. Due to the antioxidants, vitamins, calcium and mineral content of these leaves, it is an ideal food for kids. Fry the moringa oleifera leaves in ghee is the best food for kids suffering from asthma and allergies too. Women, who breastfeed may suffer from insufficiency of milk at some point of time. In those times, drumstick leaves can help you to a very great extent. It helps in increasing breast milk and since these leaves has high calcium content; it enhances the calcium content in breast milk. It plays an important referee role as to the balance of hormones including thyroid. Thus it is very good for those who suffer from thyroid issues. Both high and low thyroid issues can be treated with this, as it balances the hormones. As discussed it removes all toxic and poisonous elements from body and hence keeps our body fit and healthy. Studies prove that it has around 46 different antioxidants in it and fights certain cancers. It has high content of Vitamin A that helps in eradicating childhood blindness and skin diseases. While keeping all these benefits and uses in mind, it is often asked about the side effects. As the saying goes, there need to be two sides for the coin. Even though, the studies haven’t given much light on to it, the heat property of Moringa Oleifera is always not going to be good. It has enormous good properties but fears exist as to the safety on pregnant women. Does the medicinal property of Moringa Oleifera make the uterus of pregnant women shrink, resulting in miscarriage? Disclaimer: These recipes and juices are not medical prescriptions. It depends on the individual and their health condition, whether it will suit you. Any allergy to the ingredients shall be the responsibility of those who use it. The responsibility vests on the persons who try to use these, and not us.